Hopefully you read my post about our recent trip to Spain to surprise friends. If you haven't, why? Fear not, you'll find it here. 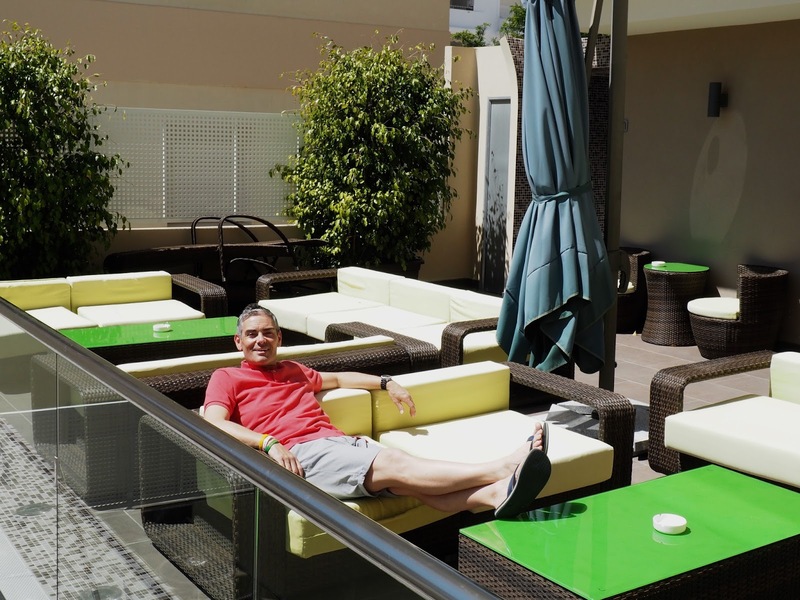 We stopped at an adults only boutique hotel in the delightful area of Carihuela on the Costa Del Sol and I thought I'd do a quick review for you. 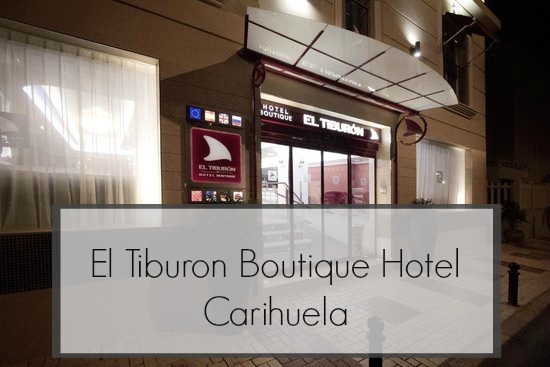 We booked through Booking.com and you know what it's like, you read all the reviews and you sometimes wonder if you've made the right choice but I have to say we enjoyed our stay at the El Tiburon. We arrived around lunchtime and had a lovely warm welcome by a lady called Helena. She quickly checked us in, gave us our room key, breakfast information and most importantly the code for the free wifi! 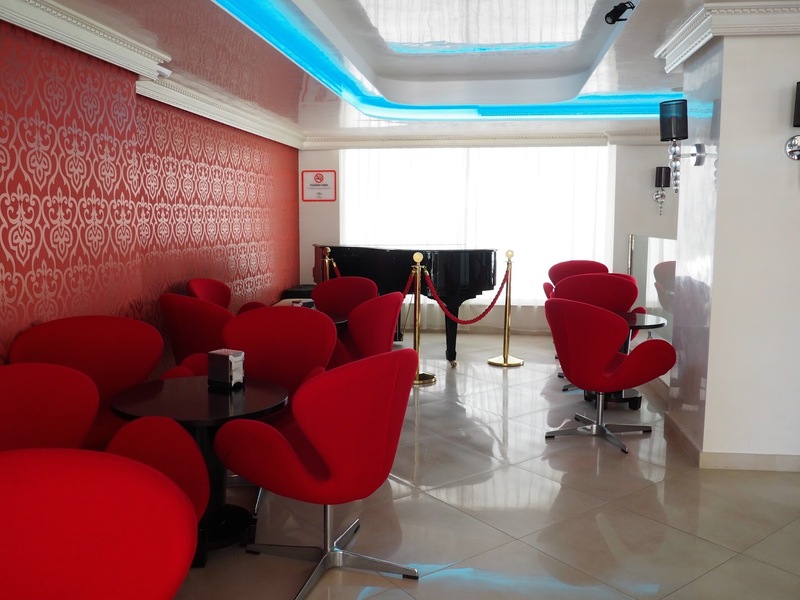 The hotel's reception, bar and lobby area are open plan and as you walk in you notice how bright, airy and spacious it is, and it's refreshingly cool! 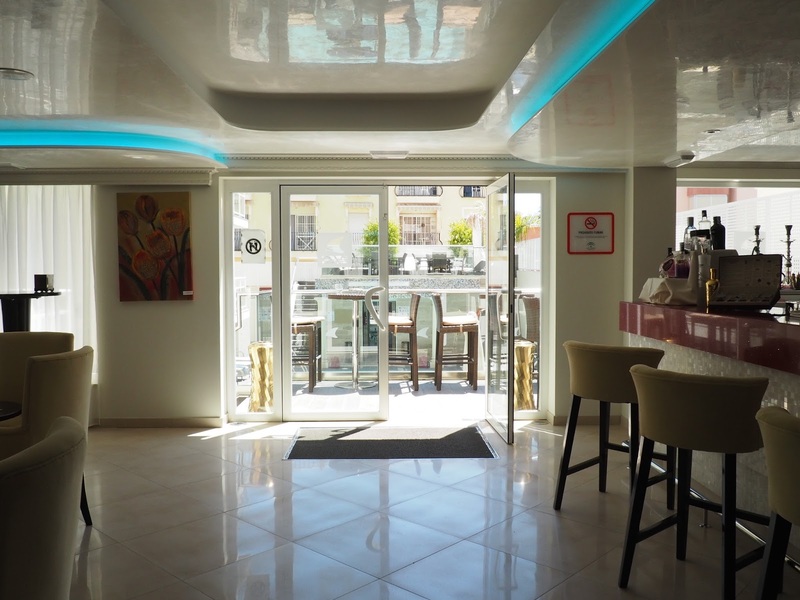 Helena told us the hotel had been totally refurbished a couple of years ago taking it from a more traditional Spanish style to the modern stylish hotel it is now. Our room was on the first floor and our balcony overlooked the pool (bonus). I did read a review where someone said their 'deluxe' room overlooked a block of apartments so stick to the standard rooms! The balconies are equipped with a table and two chairs but are fairly small but then saying that I don't feel you need a huge balcony anyway, as long as you can sit down with a bottle of wine, that's all you need. The room wasn't the biggest but it was bright and airy and it was spotlessly clean. The rooms have air conditioning, an iPod/phone doc, flat screen TV, fridge, great if you take a travel kettle like us (need my morning cuppa) and a free safe, which we thought was great, you usually have to pay!! Oh and hotel slippers too. The funny thing is I always take my slippers on holiday with me, weird I know but I need foot comfort, but this time with only having hand luggage I couldn't fit them in so these little mules came in very handy indeed. We had to laugh as although we had plenty of wardrobe space there were only 5 coat hangers!!!!! I know you often have to double up on holiday but that was ridiculous, so I sent Mr C on a mission to get more. He came across a cleaner on our floor, he waved a coat hanger at her, and she came back with some. Problem solved. The bathroom was modern with a slight Spanish twist and so so clean. This little area where Mr C parked his bum whilst I was unpacking was to the side of our balcony, it's lovely and gets the sun all day but I can imagine it being quite busy in the summer months, so your balcony wouldn't be very private as it's in such close proximity. It's a small boutique hotel so goes without saying the pool area is quite small. It's in keeping with the rest of the hotel, with decking all around, rattan furniture and sun beds (free towels provided) and an ice cold jacuzzi. The only downside to the pool area is that it's quite shaded and you have to chase the sun around, something that would be a problem when it's busy I think. Breakfast was a continental affair and was ok. 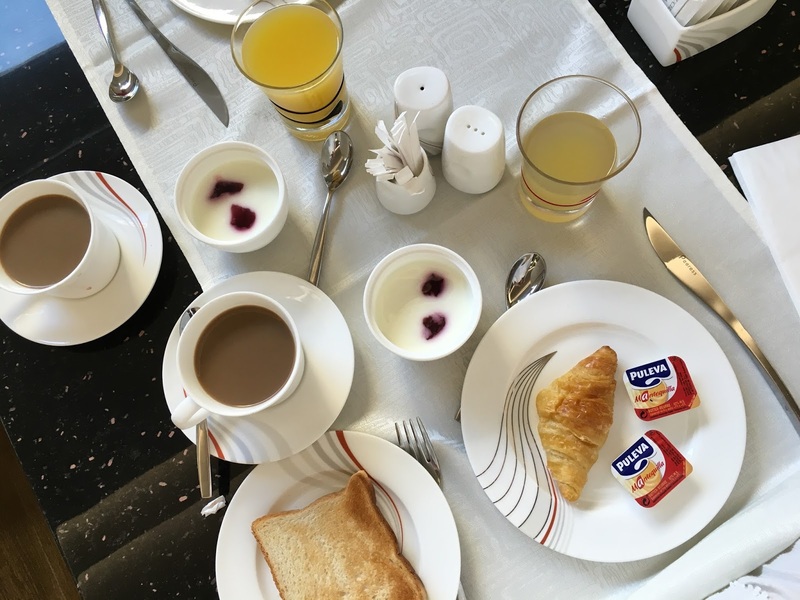 I'm not a big fan of breakfast as a rule but I do like a cooked one on holiday every now and then so it would have been nice to have the option. Breakfast is served until 10.30 here so ideal for me as I can't eat at the crack of dawn. They serve the usual meats and cheeses, pastries, yogurts and the coffee was piping hot. 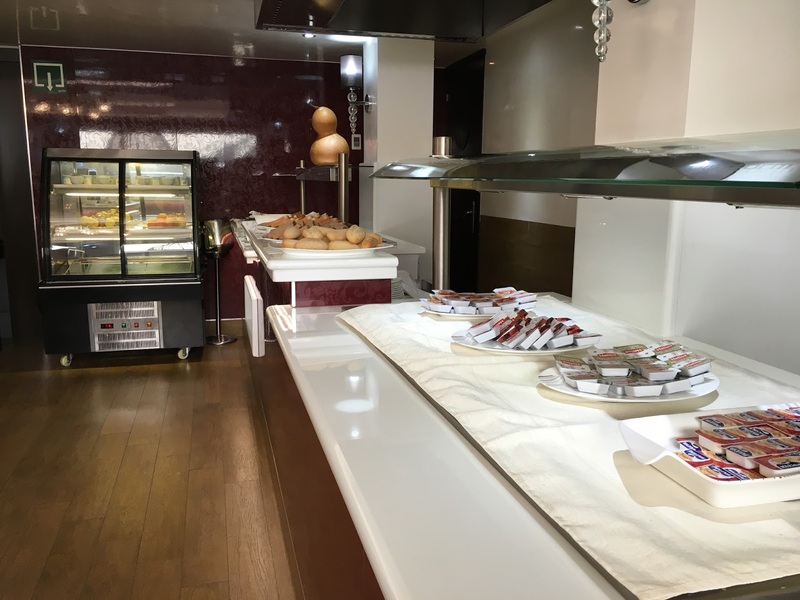 The breakfast room is in keeping with the rest of the hotel and as you can see wasn't busy at all with Mr C looking all sad and lonely down there! 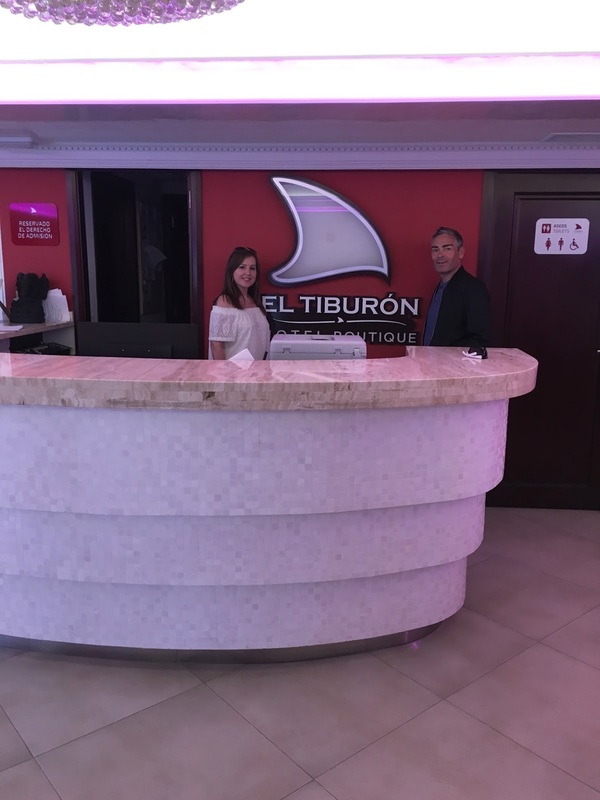 Although our stay at El Tiburon was a good one there a few tweaks that would make it an even better one. First thing is the mattress, it was like sleeping on concrete! Please, please change them. Another real issue for me is the fact that there was no full length mirror in our room, BIG no no for us ladies. Apart from breakfast we didn't see any other food being served in the hotel at all, and didn't see any evidence of any on offer, not even any snack menus anywhere. If you're spending all day around the pool you need to eat so what do you do? They may offer something in high season but personally I think they should at least offer snacks or sandwiches at lunchtime even in low season. 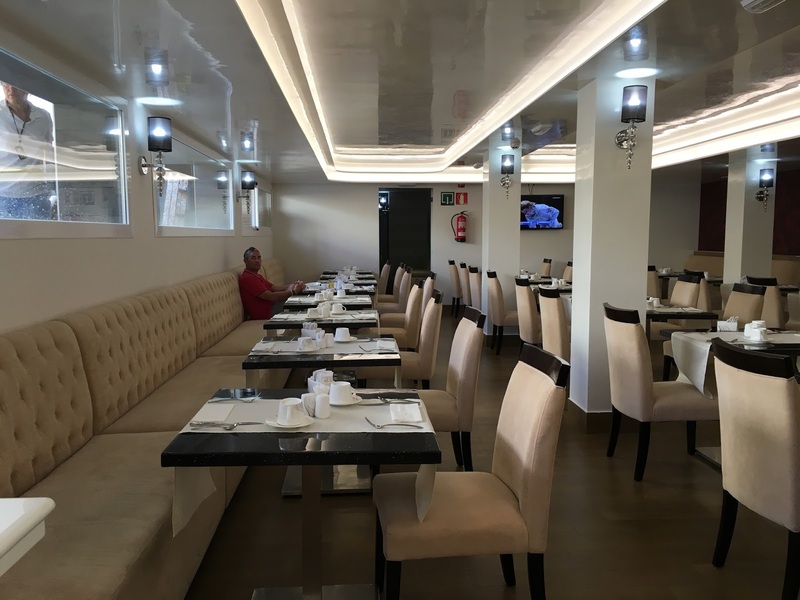 The write up says they have a snack bar and buffet restaurant but not sure where or when! The photo below made us laugh. Helena insisted she take a photo us by the hotel sign so we could Facebook it! 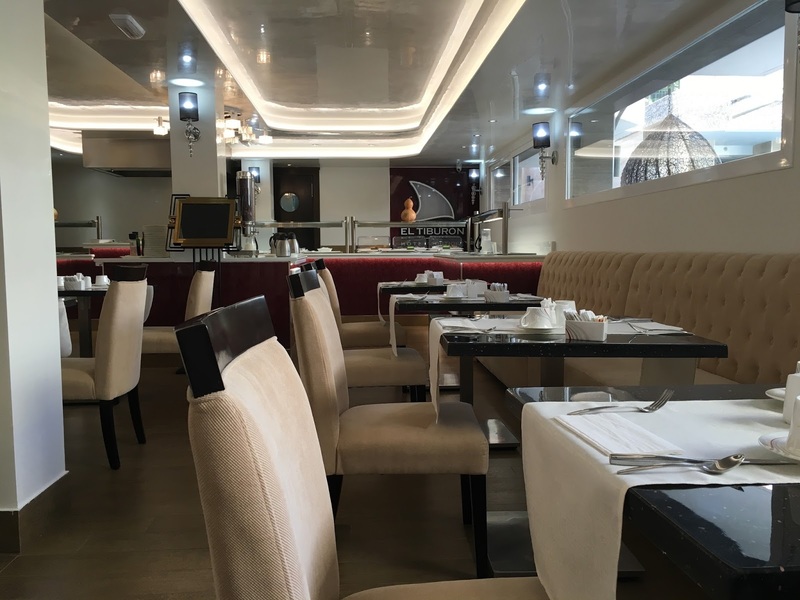 We would definitely go back to the hotel for a short stay, I couldn't stick the mattress for any longer than that, and the location is what makes it perfect. It's on a quiet road and is a few minutes from the beach, shops and restaurants. The hotel has mostly good reviews on Trip Advisor and you're bound to get some not so good, because you just can't please everyone. Some mention that the staff are not very friendly or helpful but to be honest we found it the opposite, okay, some of the staffs English wasn't that good but you're in a foreign country! A big shout out has to go to Helena though. At the time of writing this the hotels website wasn't working for some reason (it's there and we viewed it before so it may be okay by the time you're reading this) but if not you can see it and book here. This looks like a lovely hotel, really makes me want to go on holiday!